Had an excellent turn-out this day! Included a new volunteer - Chili Ornelas - a friend of Ron Marcotte's. Hopefully we did not scare Chili away! There was a wide range of activities going on on the 18th. Several guys pitched in to repair the Model T Signal Corps truck. Al had a tranport "incident" on the way to Camp Mawbry, bending a steering tie rod. Fortunately, Roger had a spare Model T front end (in the weeds?) and the repair was quickly made. A huge number of folks pitched in on the Tommy wings. We have graduated to the lower wings, with the usual steel wool application, repair, and revarnishing. Roger has many of the wing fittings out being powdercoated, so these ought to look gorgeous when they return. There was work remaining on the upper wings that were the focus of last work day's efforts. This effort was led (cheerleaded?) by Tom Miller. 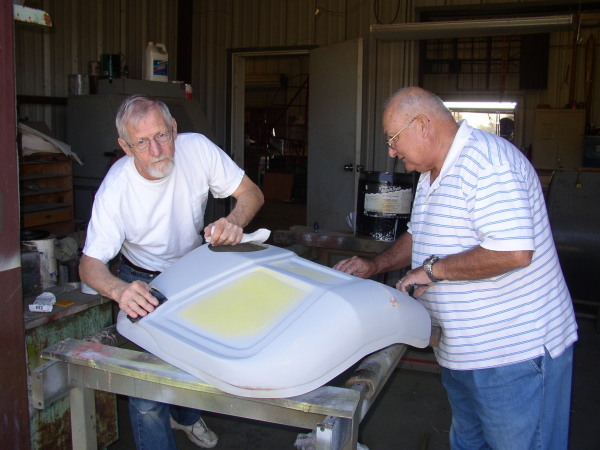 Roger and Ted Dawson applied several coats of silver dope to the Tommy tail surfaces that have already been covered. Let the sanding begin!! Dave Miller spent a fair amount of time working on his tan, smoking cigars, and mowing areas around the hangers. The Meyers OTW was started up and run for several minutes. As usual, the engine was nearly hydraulically locked due to oil seepage and took some time to clear. Despite that, the engine actually started fairly easily! Roger made sure the oil feed was secured before allowing the engine to stop running! Bits of the Fokker D.VII were reconnected, as the airplane will not be going to Lackland. Specifically the ailerons. Ron and Sanford spent a large part of the day working on the D.VII's nosebowl. The exterior finish is acceptable (finally!!) and the black paint was applied to the 'radiator' area. 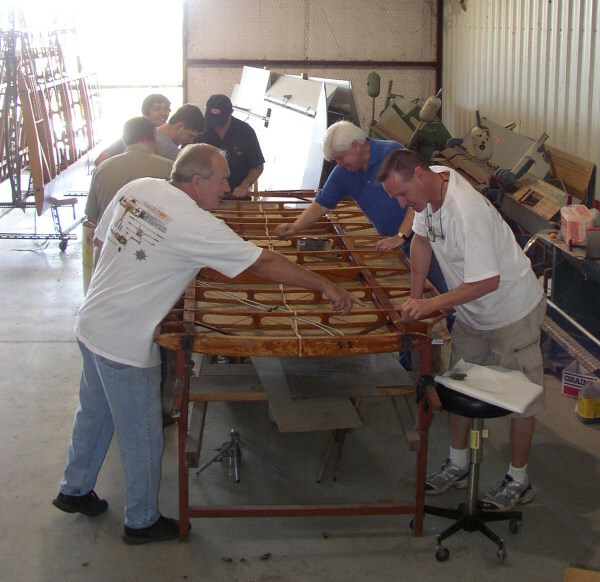 Ron and Sanford also spent time fitting the nose bowl to the fuselage. Since it does not have a running engine, the decision was made to allow the nose bowl to be 'captured' and held in place by the surrounding engine cowling panels. Roger thinks he may have sold the exhaust to a customer... it isn't anywhere to be found! Ron and Sanford (and Chili) also worked on the Indian fuel tanks. They were cleaned and sloshed with a sealer to prevent future rust!